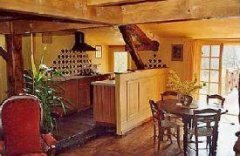 Description of Property: Our Loft Gîte is a modern extension in keeping with the 17th century farmhouse. It was originally the hayloft of the former wine farm, now tastefully or not converted to a very attractive 2 bedroomed apartment with an extensive roof terrace. Its lofty perch provides views over the quiet countryside. It is especially inspiring as the sun goes down over the valley and woods beyond. The terrace is very private and is ideal for meals at sunset, perhaps to the sounds of the ‘laughing frogs’ in the lake below. The kitchen/dining room is open-plan and sunny, with French windows leading onto the terrace. It gets even more light from a large skylight, with glimpses of the valley from the dining table or the kitchen corner. The kitchen itself is stylish and functional, with most modern conveniences including a dishwasher. The lounge area is situated under the fully enclosed mezzanine bedroom. It has a large sofa and one old fashioned winged armchair. All floors in the main space are laid with large planks and forged nails. The main bedroom is spacious with a double bed and a lovely, lovely view at sunrise, from a low window, over a sunlit olive tree. There is a writing table in one corner, a prettily hand painted wardrobe and some bookshelves for many purposes, like stashing shoes and why not!. Exposed beams and rafters add to the charm and there are inspiring views of the adjacent woods from two more windows by the side of the bed. A large dressing room separates the bedroom from the rest of the gîte. The mezzanine is a cosy twin bedroom that can be conveniently used for temporary guests. Outside Amenities: Cassanis farmhouse stands at the end of a short track off a minor road, with no sign of traffic at all, except for buzzards and roe-deer. 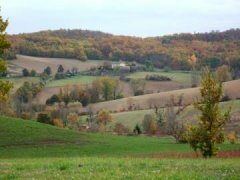 Although the place is very quiet and secluded, it is still within easy reach of the would-be facilities of "modern life": Gaillac, the nearest market town (15 000 inhabitants), is 3 miles away. The Cassanis domaine proper (isn'it a posh word?) stretches over 40 acres and is all yours from your doorstep, only to be shared with the owner and his daughter, who's running a horse livery, therefore the horses and also the tenants of 2 other gîtes, the almost inevitable, nowadays, but generally well behaved other Brits, on a more or less long term basis as well. Pet animals are welcome, depending on their size, if well educated, and can be left unattended. Surrounding Area: The old market town of Gaillac - a now buzzing little place with its old district by the lazy river, with cafés and squares and gourmet restaurants, street markets and all that, and so many culturally varied events ( most of them virtually free in the long enough good season) - is situated in what has been lovingly called the "golden triangle" of the South West of France, which makes me laugh. 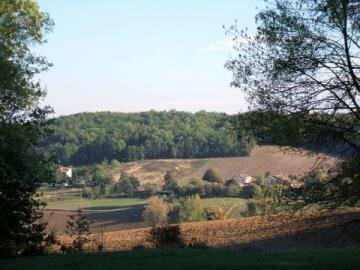 Three miles distant is the medieval bastide of Castelnau de Montmiral on its hill top, overlooking the majestic Forest of Grésigne, the most extensive oak forest in France, as it does appear from the plane, indeed, as you slowly descend. This is a rural area of happy-go-lucky countryside: rolling farmland interrupted here and there by chalky outcrops where only junipers, scrub oaks and wild orchids will grow. Miles of traffic free, winding roads across a timeless landscape where innumerable old villages, châteaux and pigeonniers bear witness to the rich past of this ancient province of Languedoc, the land of troubadours - that enjoys a semi-mediterranean climate. Among the nicest places to visit, within a very short radius, are the breathtaking citadel of Cordes, a gothic jewel I must say, Puycelci on its buttress overlooking the Grésigne forest, Penne and Bruniquel, two other bastides both set in dramatic scenery, in the nearby Gorges de l'Aveyron. Nae bad. 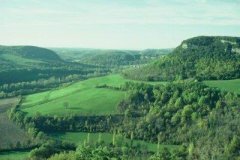 The Tarn, a mighty river of many a mood, is a world of its own to explore, upstream of Gaillac, to its distant, awe-inspiring gorges in unspoilt, rugged Aveyron. Been there and got the t-shirt. Albi, a graceful city which houses the Toulouse Lautrec museum, and famous for its brick cathedral, is 15 miles away. 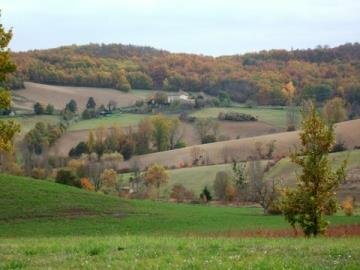 Toulouse, the "capitale du sud-ouest", mind the word, very similar to Paris on a small scale in many ways, apart from a definitely Spanish influence, is only a 50 minute’s drive away. Very unfortunately! The local area is ideal for either rambling or hiking, with numerous marked paths through the forest or heath. Many caves can be visited on your own, provided you have torches, but they might prove a little difficult to spot without a guide in such a wilderness. There is canoeing down the gorges of the Aveyron, horse riding, mountain biking, golf, swimming, tennis, paragliding, fishing and what not, all within easy reach. Central heating (There is an automatic, care free system which controls the gîte’s temperature. It provides both heating and air-conditionning according to temperature set by the occupant. ). Mains water. Septic tank. Electricity. Telephone. Broadband Internet Access. Television. Satellite TV. Conventional oven. Hob. Fridge. Dishwasher. Washing Machine. Children welcome. (May not be suitable for toddlers, due to the roof terrace). Smokers accepted. Pets may be allowed by prior agreement. They do scratch, even when house trained. 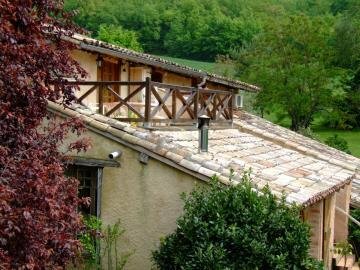 The owner Hervé, a now retired teacher of philosophy and French litterature, his daughter Pauline, manager of the livery, and their English neighbours, very friendly, will readily help you out in all matters and, hopefully, make you soon feel at home. Hervé can provide, if not French tuition proper, assistance and advice to bettering your fluency, as well as attention towards house hunters, throughout the prospecting, buying and renovating procedure. Off-road parking. Pricing Info: Rent includes water for 2 people. An extra 25 euros per person may be required for any extra person. Electricity monthly charges would seem to amount, on average, from 80 euros in the coldest months (Dec. Jan.) down to 15 euros. Internet access and telephone free (excepting calls to mobiles).